It would be easy to call Carolyn Read a preservationist and leave it at that. How many people would settle in a ranch house built 130 years ago and raise a family there? Or call her a conservationist. 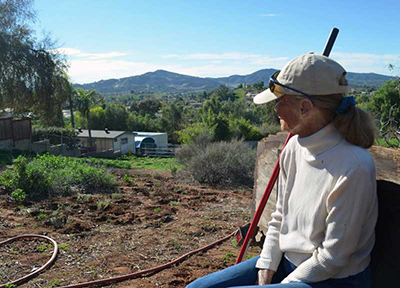 Read has made sure that native plants that were in danger of getting choked out by other invasives are again thriving in the arid reaches of her San Diego-area ranch. Make sure you give Read credit for her business sense, too. She started a horse-themed magazine more than 30 years ago that remains an award-winning publication on the West Coast. She’s also raising and selling boysenberries. Read is a rancher, an active community member, an equestrian advocate, a conservationist, a historian, an entrepreneur, a grower, a mother and a grandmother — all of which stem from her opportunity to build a life on the land. She’s worked with others to ensure that a ranch started in the 1800s remains viable, even as development nears its borders. Among her collaborators: the U.S. Fish and Wildlife Service (Service), which advised her as Read restored a hillside with coastal sage scrub. From that collaboration came a friendship with a Service biologist. That connection has roots as hearty as the sage scrub growing on the hills. Read, 86, is just happy to remain on the land that she has tended so carefully for more than five decades. In 1874, an Arkansan by the name of Reynold Bascomb Borden traveled cross-county in a covered wagon. It came to a halt in a valley blanketed by coastal sage scrub and sunshine. In 1882, he would construct one of the first homesteads in this remote valley, now present-day San Marcos, in San Diego County. Today, the property also is home to California quail, hummingbirds, pollinators, lizards, rattlesnakes and birds of prey. She pointed to a hawk’s nest in the top of a eucalyptus tree. In 2012, Read decided she needed help to restore wildlife habitat on her land. She worried that the native flora was getting overwhelmed by invasive plants. Jonathan Snapp-Cook, a Service biologist, visited her ranch. He knew right away that they shared an appreciation of land stewardship. Snapp-Cook and Read embarked on a restoration project to benefit native wildlife. A portion of the hillside behind Read’s house was chock-full of invasive plants while native coastal sage scrub voluntarily grew on the property’s dirt roads. The idea: transplant the coastal native sage scrub in the roadway to the tract where invasives grew. It was best, they decided, to use the plants they already had to make the restoration take root. So far, the native plants are winning. Snapp-Cook and Read have completed three small, flourishing sections of restoration — but they didn’t do it alone. Read’s hired farm hands, family and grandchildren helped restore the hillside, one plant at time. The restoration project has been a lesson for Read and her family; they see the sage scrub as a valuable member of the ranch ecosystem. The view from Read’s front porch has changed since she moved in. Over the years she has watched development slowly creep toward her ranch. The 14-acre property is flanked by rows of white-and-beige houses on one side. An open space soon to be developed shares a property line on another. A hillside of coastal sage shrub touches a third. Even as San Marcos extends its borders toward her, Read remains determined to protect the land and the creatures that live there. Every inch of the 14-acre ranch continues to be productive, which includes seven acres of preserved habitat. Read has four horses on site, with pastures to match. Three years ago, she turned her attention to a local delicacy. Read began growing boysenberries — a move driven in equal parts by an appreciation of history as well as the bottom line. The boysenberry enjoys historic importance in Southern California. In 1932, Knott’s Berry Farm in Buena Park, California, created a new kind of produce — a cross between red raspberries, blackberries and loganberries. The Knott family dubbed it the boysenberry. The new berry was a tough thing to cultivate, its bushes riddled with thorns, but the payoff was good, too. Consumers loved the boysenberry. So does Read. Growing and sharing California’s homegrown classic fruit is the way Read has chosen to share the living heritage of the homestead with the greater community. 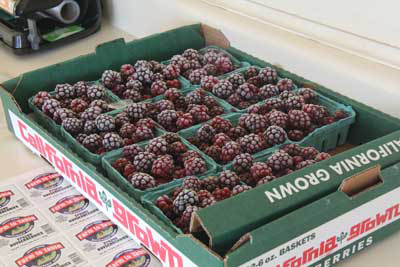 For Read, the boysenberry provides a tangible, tasty link to the area’s rich history. “Without the places that keep our stories alive…we lose some of the most profound parts of our local history,” she said. She feels that way about her ranch, too.